Online phonics games is a website dedicated to help teachers and parents make learning to read fun by using online phonics games and other interactive online phonics resources. There are lots of paid resources online for phonics but my site is a collection of the very best free online phonics games that I can find. It is also a collection of the best online phonics songs and helps to answer the question I get asked most by parents, ‘what is phonics?!’. We also have an online phonics glossary to help you learn your digraph’s from your grapheme’s. If you know of anymore online phonics games that you think should be included, please do let me know by getting in touch on our contact page so I can test them out! *NOTICE TO SCHOOLS – You do not need to ask my permission to link to my website! How to play: Listen to which phonetic sound you have to find and click all the circles with that sound in. How to play: Drag the correct word to the picture and watch as each word is sounded out and blended together if you get the answer right! How to play: Listen to the word and pick sounds from the list displayed to spell the word. Best for: Segmenting and blending. How to play: An interactive way to practice sound buttoning skills. Drag the sound button underneath each letter. A dot is for single letter sounds, short line is a digraph, long line is a trigraph and the curve line is for a split digraph! How to play: Read each word that appears on the screen. Drag real words into the book and alien/pseudo words to Albee for him to eat! How to play: Print off the bingo cards pdf and then ‘click’ pull to reveal new words, first one to complete their card wins! How to play: Look at the picture and drag the correct sound into the word to finish the word. Then watch as it gets sounded out and read back to you! 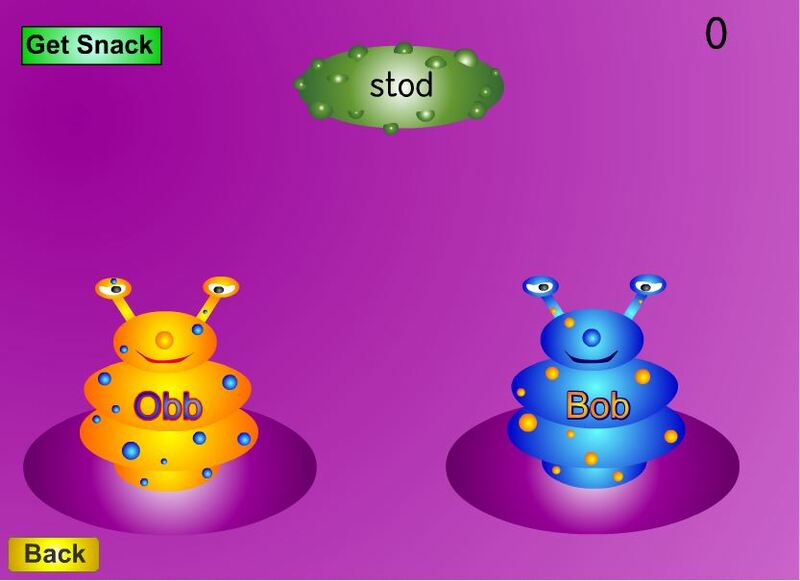 How to play: Click for a ‘snack’ and feed the alien words to Obb and the real words to Bob. How to play: Listen to the word and pick from the choice of sounds to spell the word. Do you have an online phonics game you would like to see here? Get in touch through our contact page.